Embassy of India organised a commemorative event to launch the start of Mahatma Gandhi’s 150th birth anniversary celebrations at the Swami Vivekananda Cultural Centre, Seoul on 2nd October 2018. About 150 People comprising of Korean dignitaries, Ambassadors, members of the diplomatic corps, media, academia and Indian community attended the event. 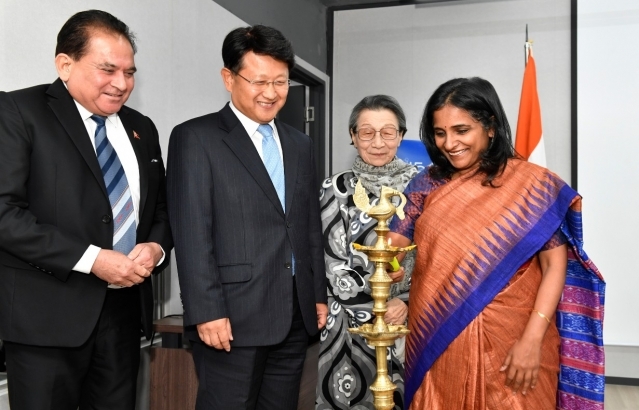 The program started with the lighting of the ceremonial lamp by Ambassador Sripriya Ranganathan, Ambassador for Public Diplomacy MOFA Mr. Bahk Sahng-hoon, Padma shree awardee Ms Kim Yang-shik, and Ambassador of Nepal Mr. Arjun Jung Bahadur Singh. Ambassador Sripriya Ranganathan welcomed the guests and spoke about the messages that we should take from Gandhi's life. This was followed by special remarks by the Chief Guest Ambassador for Public Diplomacy MOFA Mr. Bahk Sahng-hoon. Both the Ambassadors jointly released the Commemorative Stamp on Gandhi and inaugurated the Video Display on Gandhi's life at five prominent locations in Seoul. Renown Pansori Singer Ms. Lee Eun-hee captivated the audience through her performance of Gandhi Bhajan (Vaishnav Jan to). Prof. Kim Chang-won, Director of Institute for India Studies, Hankuk University for Foreign Studies gave an introduction of Gandhi Ashram in Korea. Later, Dr Shim Minha Professor at HUFS spoke on Gandhian thoughts and its relevance for current generation. The event concluded with a Special Remarks by Padmashree awardee Prof Kim Yang-shik. Earlier in the morning, the Embassy conducted an interactive session on Gandhi with the students of the Gandhi school at Jecheon. The students shared thoughts on Gandhi and participated in a quiz that followed. A session of yoga and meditation was also introduced to the students.